I never know whether these make any difference or not, but as I’ve tried a few, this is my round up of what’s worked and what hasn’t. Most of these ideas are for the stable and designed to keep your horse stimulated whilst penned up. Pretty much all of them involve food, so if you have a fatty, may not be that useful. 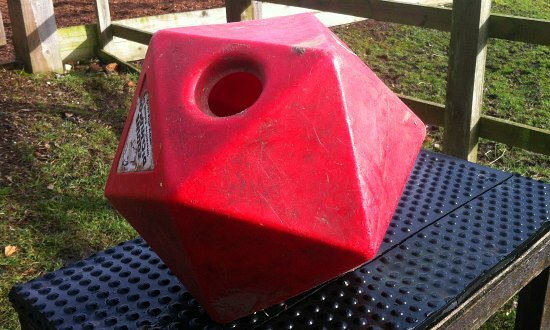 I don’t have one of these but know of others who have found them useful for horses that get lonely in the stable. They reckon the animal looks in the mirror and believes he has a new friend. I shove them deep into the hay net. This means they have to find them and it slows down how fast they get through their hay. 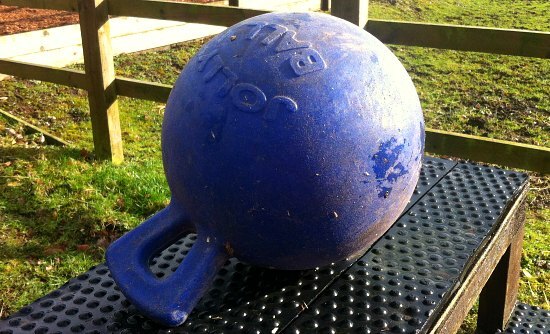 This is essentially a hardwearing rubber football with a handle on it. The horse can pick it up with their mouth, or kick it around. Not sure how much my mare uses this but it does move and she’s quite fond of shoving it in her water bucket. Get veg like carrots, parsnips and suede and thread them on a string – hang them from the stable roof – hours of fun! You can get these in various forms, balls, cylinders or just simple tie ups. The problem I have is, is that you can’t limit them and my horses tend to eat them all in one night. Especially when it’s been cold I’ve been known to put apples in my horses water buckets. This allows them to bob for the apples but it also stops the water freezing up entirely.